Is your workplace safe? Are potential danger areas clearly marked? If the lights went out would your employees be able to find their way to an exit? Ensure a "yes" answer to all of those questions with Ergomat's DuraStripe line of floor marking shapes, labels, tapes, and signs. QSource.com recently added hundreds of these items from a number of Ergomat's popular DuraStripe lines (including DuraStripe Glow, Mean Lean, Supreme V, and X-Treme). By introducing these visual indicators, your employees will be better aware of proper procedures and better prepared to navigate the workplace safely. Lead them through the darkness with DuraStripe Glow, the peel and stick floor/aisle marking tape. 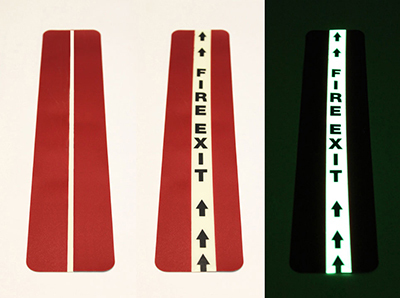 Made of glow-in-the-dark material, this durable tape is quick and easy to install and requires no dry or cure time. Available with or without text and in a choice of widths for the glow line. 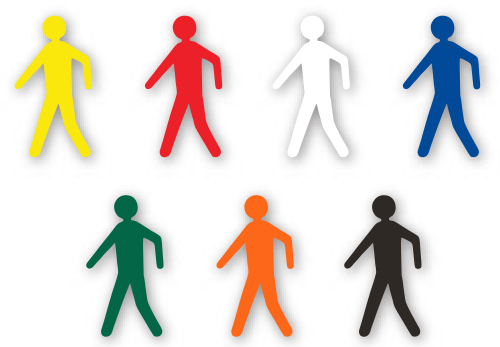 Have your employees literally follow the footsteps to workplace efficiency and safety. The economical, low-profile DuraStripe Mean Lean shapes and tapes are great for Visual Workplace, 5S, and Lean applications, aisle striping, and come in a variety of shapes (including arrows, circles, letters, numbers, and yes, even footprints) and seven standard colors. This durable material is easy to clean and remove, scuff-resistant, and requires no messy cleanup. For a long-lasting floor-marking solution, Ergomat has combined their original DuraStripe material with their DuraStripe Lean to create a fifth-generation product: DuraStripe Supreme V. Supreme V mixes the original DuraStripe adhesive with DuraStripe Lean's low profile to make a product perfect for use in almost any environment and a superior option for imperfect floor conditions. DuraStripe Supreme V features tapered edges to deter possible tripping and impact dangers, is available in a variety of shapes (including triangles, corners, pluses, squares, and pedestrians), colors, and sizes; and is easy to install. For those extreme, critical environments where forklift/tow motors are in frequent use, check out the heavy-duty DuraStripe X-Treme line of floor-marking products. DuraStripe X-Treme features a specially coated surface (for easy cleaning) and beveled edges to deter damages to the material. This durable DuraStripe line is also ideal for Lean applications (such as Six Sigma, 5S, etc.) and is available in a number of widths, colors, and shapes (including curves, strips, t-shapes, double-sided arrows, and pux). All of the aforementioned DuraStripe products include a two-year warranty and are available in a number of dimensions, colors, and shapes. Please visit QSource.com for further information. To place an order for DuraStripe floor marking items or Ergomat products in general, please submit it via the Web site or contact us at 800-966-6020 or qsales@qsource.com.